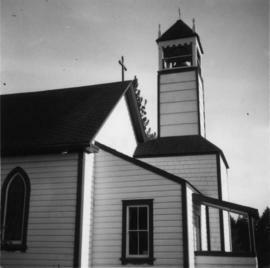 Photograph depicts a bell tower of a Roman Catholic church in the Saanich Peninsula. Photograph depicts the bunker and cab view of the Royal Scot that was built in Britain in 1947 (or before). 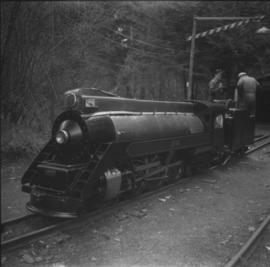 It was coal fired and was being prepared for its first run of the year. 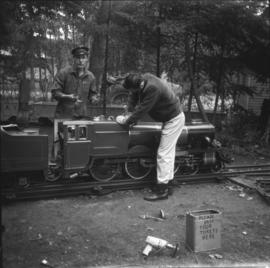 Photograph depicts one of the two steam locomotives that operated on the Victoria Miniature Railway. Labelled "Royal Scot." Found in Scarborough a few years prior, in poor condition. 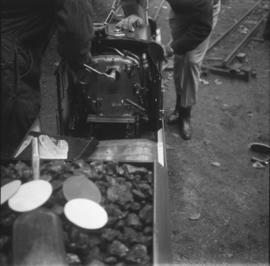 Carries a boiler test date of 1947 by Vulcan. Photograph depicts 2 steam locomotives. On the left is Canadian, numbered #1941 and on the right is British, labelled "Royal Scot." Both were coal fired. 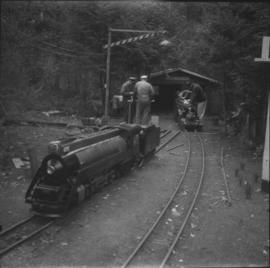 Photograph depicts one of the two steam locomotives that operated on the Victoria Miniature Railway. Labelled "No. 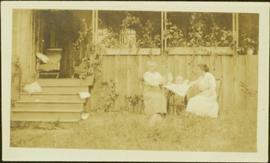 1941," Canadian and was built by Routledge of Mission City. 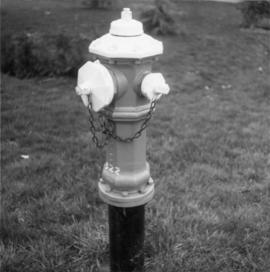 It was overhauled by a citizen of Victoria. Fired by coal.